Spotify saw its revenue grow by a healthy 52% to €2.93bn (US $3.3bn) in 2016. However, according to documents just filed in Luxembourg, its annual net loss widened by 133% to a momentous €539.2m ($597m). Before anything else, it’s worth delving into what contributed to this loss – which stood at €556.7m ($616m) on a comprehensive basis (when further foreign exchange differences are taken into account). Spotify’s operating loss in 2016 was €349.4m ($387m), widening 48% on 2015 – a smaller percentage figure, you’ll notice, than its overall revenue growth. This operating loss was caused by business basics – such as investments in product development and growth, in addition to a €2.48bn ($2.7bn) cost of sales (mainly spent on royalty payments to labels and publishers). 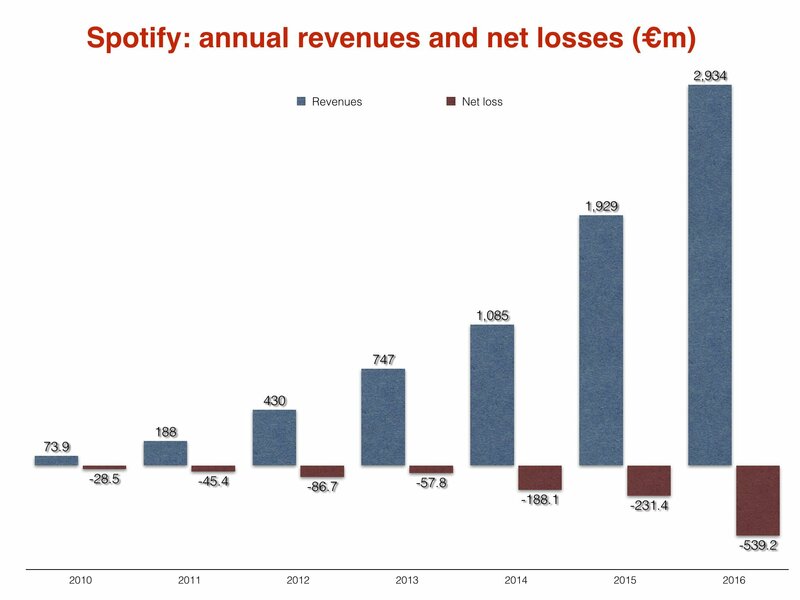 Outside of that, Spotify suffered an unusually large €336.6m ($373m) in ‘finance costs’ – a figure which was some €310m more expensive than the equivalent figure in 2015. This €336.6m included Spotify’s cost of debt in 2016, plus a non-cash charge related to accounting treatment of its convertible debt. And its this hefty finance-related blow which explains why there’s such a difference between the annual change in Spotify’s net loss (133%) and its operating loss (48%). In fact, the company’s operating loss as a percentage of revenue was 11.9% in 2016 – versus 12.3% in 2015. Elsewhere in Spotify’s results, we can see that its subscription business brought in €2.64bn ($2.9bn) last year, up 52% on the €1.73bn ($1.9bn) generated in 2015. Its advertising-funded business generated €295m ($326m) in the 12 months, up 50% on the €196.2m ($217m) accrued in 2015. 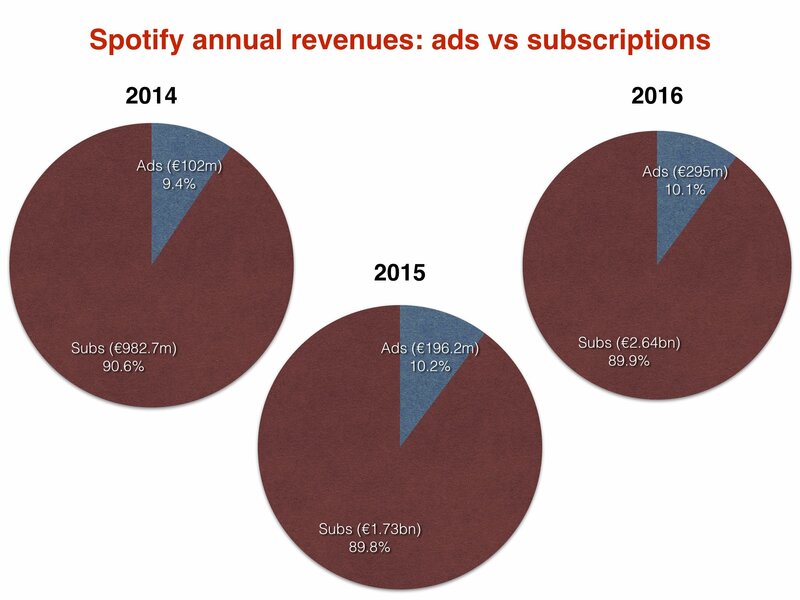 That meant advertising claimed 10.1% of revenues in 2016, with subscription taking 89.9% – a slight lessening in ad-funded’s share versus 2015, when it generated 10.2% of Spotify’s sales. Spotify’s wage bill grew 41% to €231m ($256m) in 2016, versus €163.3m ($181m) in 2015 – while its global headcount jumped 37% to 2,162. Overall, that means the average Spotify employee received a wage worth €106,841 ($118k) last year. 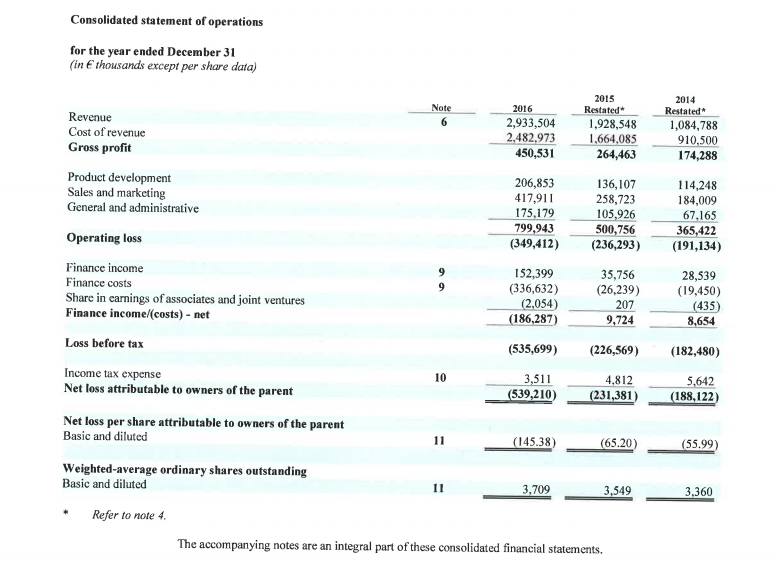 As you can see below, Spotify has restated its financials for both 2014 and 2015 across all sectors of its business.